Article Originally Appeared in the Times Union. For our regular Capital Region Q&A feature, we ask local people questions about themselves, their jobs and the place we call home. 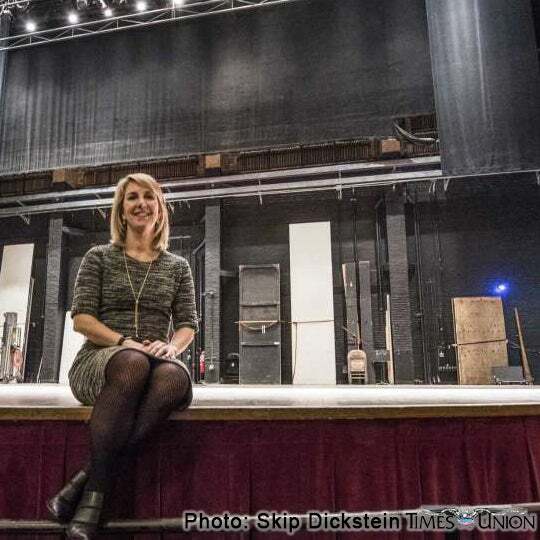 Today's subject is Susan Rosko Fogarty, executive director since November of the Palace Theatre in Albany. Fogarty, 48, lives in Saratoga County with her 12-year-old daughter and her son, 8. Answers have been minimally edited for space and clarity. Q: Your arrival at the Palace two and a half months ago had its challenges, starting with a secretive hiring process; some employees and board members said they didn't know a management change was in the works. How did that affect your first weeks on the job? A: I would say that's not exactly what occurred, but any leadership change is certainly a challenge. The No. 1 priority is the staff and the team. They responded wonderfully. I'm incredibly lucky to have an incredibly dedicated team at the Palace, and that made the transition much easier. Q: Right after that, a potential crisis arose: Finalization of the sale of the building from the city of Albany to the Palace Performing Arts Center, the nonprofit that had leased and managed the theater since 1984, dragged on for nine months after approval by the Common Council. If it hadn't been completed by the end of last year, the Palace faced losing significant historic tax credits related to its upcoming expansion. The sale went through on the last business day of December. Was that a nail-biter for you? A: Sure! But I had confidence we'd get it done. The mayor was very supportive, and, to her credit, her concerns were the community-benefits agreement related to the expansion and also making sure we had completed our memorandum of understanding with the Albany Symphony, to allow them to continue to use the Palace. Once those were worked out, we knew we were under this deadline, and things moved along quite smoothly. Q: The grand vision for the Palace, which includes renovation, expansion and a new, 600-seat theater down the block on North Pearl Street, was announced in mid-2016 with a price tag of $65 million. Recent talk has focused on the first phase, with a cost of $30 million. What does that cover? A: We are finalizing the project details, but it will include an enhanced and improved customer experience through renovations, additional accessibility including an elevator, and hopefully a lounge or other additional space that customers can enjoy. We also have an important need for more arts-education space. We're already invested in education programs in dance and theater; moving forward, we want to do education regarding the trades — the production and technical skills, the behind-the-scenes stuff — and we're committed to making sure people right in our own neighborhood can participate in those training programs. The third piece will be what I call the unsexy but necessary stuff, how productions can load in and out, the backstage accommodations. Those changes and improvements will make us able to attract different kinds of programming we can't get now. Q: How much money has been committed toward the $30 million, and what is the timeline on the project? A: We are not yet announcing any of the individual commitments. What's been announced now is the state money, the $2.5 million Regional Economic Development Council grant we got last month. I would like to launch a capital campaign after we have about half of what we need for the first phase. I definitely feel that's doable between grant money, historic tax credits and interested individual donors. We are committed to not going into a big debt situation to do this. As a former banker, I'm mindful of how the economy as a whole can affect a project like this. Q: What is the fundraising climate like now? A: I'm a firm believer if you have the right project and the right elements, you can raise the money. There is definitely a strong interest in seeing the Palace project happen. We've just joined the Alliance for a Creative Economy, which includes Proctors, SPAC, Cap Rep and others; we're committed to working together with all arts organizations lift all boats. Q: Best guess: Will the full $65 million dream be realized? A: I hope so. I am nothing if not aspirational. I do think the first phase will create the momentum we need. I can't predict the economy, but we have a passionate community of people who are really dedicated to getting this done, up to and including a true $65 million downtown arts district where people can come for an entire day of shopping, dining and enjoying great music or theater or comedy. People have such strong feelings about the Palace and its history and its place in their lives. It really, truly is an honor to steward this team and this place. People care deeply about what happens here. Pop quiz: Which one of the following acts did not perform at the Palace: Bruce Springsteen, Pink Floyd, the Rolling Stones or Guns N' Roses? A: I'm going to go with Guns N' Roses. Q: No. GN'R played a tiny crowd of less than 200 at the Palace in 1987, before their debut album, "Appetite for Destruction," came out and went on the sell 30 million copies. Q: Guns N' Roses opened for Aerosmith the next summer at SPAC and drew 25,000. A: That's great. So who didn't come to the Palace? A: I swear that was my second guess. Q: You were in the music business for two decades. How did that prepare you for the Palace job? A: In a lot of ways. It starts with being familiar with the music industry, knowing how to work with artists and managers and knowing what is important to them. And it also helps that I'm a huge music fan, and I can bring that to what we do in terms of programming. When I was in the business, there was tremendous change: We went from cassettes to CDs to digital downloads. I understand firsthand the importance of being fast, flexible, getting ahead and moving with the times. I feel very lucky to be in a venue for live music that, God willing, will never be taken over by digital. There is something that happens in a live environment that is so of the moment; the room is electric, and that cannot be replaced. It's a wonderful, wonderful thing to be in a theater during a live performance. Q: Although you are a Capital Region native and graduate of Shenendehowa High School, you spent most of your adulthood outside the area. What changes, positive and negative, were most obvious to you upon your return? A: The most obvious thing is how we're becoming increasingly diverse. We're still a rather homogenous region, but we're getting more diverse. What was really interesting moving back as an adult and joining the business community was finding out how closely everyone works together and are truly supportive of each other. This is particularly true in the women's business community, with people mentoring younger people, women executives helping other women. This is one of the most tremendous regions you can be in as a woman in business. Q: Speaking broadly, what can you tell us about Capital Region residents and their patronage of live entertainment? A: It's fantastic. Although the entertainment dollar is limited, I'm firmly convinced that if you bring the right programming, people will pay for it. People like that they don't have to travel to New York or Boston to see top touring acts and shows. As we expand, we will be able to extend our programming and grow with the region, and people will embrace that. Pop quiz: The Palace marquee, replaced in 2014, has LED bulbs, making it much more energy efficient. How much was the marquee supposed to save annually in utility costs when compared to the one it replaced? Q: The estimate was $31,500. Q: Do you know if that projection turned out to be accurate? A: I'd have to check. There's nobody more on-point than our facilities team, so they'd know, and they probably underprojected; the savings is probably more than that. Q: What would be on your wish list for acts you'd like to see on the Palace stage for 2018? A: I'd love to have Chris Stapleton, definitely Lukas Nelson. I'd like to see Cardi B come back. I hope we'll continue to get the best comedians as well as the up-and-comers, and I'd really like to see some of the folks that are coming from the podcast world. We're also working on getting the word out to the largest touring acts. If Lady Gaga wants to do a show in a smaller theater, she needs to know she's welcome here; if the Foo Fighters want to do a one-off acoustic tour, they need to know this is a wonderful place to play, with the best production and front-of-house staffs you could ever want. Q: Are there any show announcements you'd like make, or hint at, right now? A: Out of deference to our programming team, no. But I can say that this year we're 24 shows ahead of where we were last year at this time in terms of what we've booked or have on hold, so there's some really nice momentum. Q: Because I have magical powers, I can arrange for you to trade jobs with anyone in the Capital Region for one day, and I can give you the skills to do that job. With whom would you like to trade? A: Daquetta Jones of the YWCA of the Capital Region. She does what I would call the real work, meaningful work affecting women, children and families. It's a good thing it would be for only one day, because I could never do her job as well as she does. She and the people of the YWCA are making a difference in people's lives day after day. She also has the fiercest Mohawk ever. I'd be happy if I could rock that on my head for a day while doing her job.